Stable, reliable and durable. That’s how you sum up Kubota track loaders. Kubota track loaders are built from the ground up at track loaders, unlike other brands that turn skid steers into track loaders. 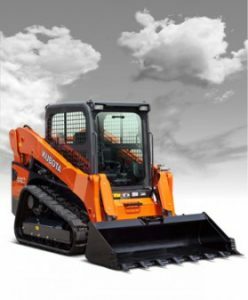 Kubota’s integrated undercarriage leaves no exposed hoses or opening for a sturdier, more durable design. At Steen Enterprises, you’ll find the Kubota SVL Series in stock and ready to go to work. The SVL Series is the perfect machine for jobs that demand the traction and stability of tracks. These compact track loaders are easy to maneuver, which makes them a great solution for tight spaces. Kubota compact track loaders also provide a versatile base for grapples, hammers, rotary cutters, graders, tillers, tree pullers and much more. To increase productivity, Kubota built a comfortable cab with a wide entrance and 36 inches from screen to screen so the operator can comfortably pivot when they need to see what’s behind them. The high back seat provides plenty of back support from the shoulders to the lower torso. To keep you on schedule, the SVL Series allows you to quickly shift from low to high gear to get across the job site faster. The one-way hydraulic self-leveling feature helps keep the bucket or pallet forks in a horizontal position without having to manually adjust the angle during lifting. Give us a call to set up an appointment for an up-close look at the Kubota track loaders and learn about the available implements that add to its versatility.